With its wings stretched wide to catch the sun's energy, a Swiss-made solar-powered aircraft took off from Abu Dhabi just after daybreak Monday in a historic first attempt to fly around the world without a drop of fossil fuel. Solar Impulse founder Andre Borschberg was at the controls of the single-seat aircraft when it lumbered into the air at the Al Bateen Executive Airport. Borschberg will trade off piloting with Solar Impulse co-founder Bertrand Piccard during layovers on a 35,000-kilometre journey. Some legs of the trip, such as over the Pacific and Atlantic oceans, will mean five days and five nights of flying solo. Both pilots have been training hard for this journey, which will span 25 flight days over five months before this Spruce Goose of renewable energy returns to Abu Dhabi in late July or August. "It is also exciting because you know, you simulate, you calculate, you imagine, but there is nothing like testing and doing it in real," Borschberg said just hours before takeoff. "I am sure we are all confident and hopefully we will be able to see each other here in five months." The Solar Impulse 2 aircraft, a larger version of a single-seat prototype that first flew five years ago, has a wingspan of 72 metres, larger than that of the Boeing 747. Built into the wings are 17,248 ultra-efficient solar cells that transfer solar energy to four electrical motors that power the plane's propellers. The solar cells also recharge four lithium polymer batteries. At around 2,300 kilograms, the Si2 weighs about as much as a minivan or mid-sized truck. An empty Boeing 747, in comparison, weighs some 180,000 kilograms. The Si2 is heading first to nearby Muscat, Oman, where it will land after about 10 hours of flight. A typical passenger jet takes just one hour to make the same journey. Piccard says the best speed for the lightweight Si2 — made of carbon fibre — is at about 25 knots, or 45 km/h. 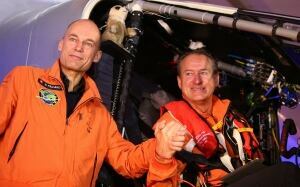 Borschberg has been practising yoga and Piccard self-hypnosis in order to calm their minds and manage fatigue during the long solo flights. They aim to rest a maximum of 20 minutes straight, repeating the naps 12 times over a 24-hour period. Goggles worn over the pilot's eyes will flash lights to wake him up. Neither pilot will be able to stand in the cockpit while flying, but the seat reclines for stretching and its cushion can be removed for access to a toilet. Armbands placed underneath their suits will buzz if the plane isn't flying level. The plane also does not have a pressurized cockpit so Borschberg and Piccard will be able to feel the changes in temperature. The pilot's blood oxygen levels constantly will be monitored and sent back to ground control. The plane will reach an altitude of around 8,500 metres during the day to catch the sun's rays and at night dip to around 1,500 metres when flying over the ocean. "You have to make the cockpit like your own house for a week in the air," Piccard said, telling The Associated Press he will keep a few small mementos from friends with him on the flight, though he declined to say what. Piccard is no stranger to aviation feats. In 1999, he and another man succeeded in the first non-stop balloon circumnavigation of the world. After two stops in India, the Si2 will head to China, where it will stay for a month until the days are longer to catch more of the sun's energy. It will also make stops in Burma, Hawaii, Phoenix, Arizona and New York's John F. Kennedy International Airport. The path across the Atlantic will depend on the weather and may include stops in southern Europe or Morocco. Those curious can follow the aircraft on Solar Impulse's website and track its battery status, energy consumption, location and flight path, as well as how much the pilot has slept and how much food and water he has left. There is also a live feed of the plane's Monaco-based control room with occasional footage from the cockpit. Borschberg and Piccard say the flight is to make the world "confront the Conference on Climate Change of the United Nations, which will define the new Kyoto protocol in December 2015 in Paris." All countries are supposed to present targets for a new global climate agreement at the meeting. Solar Impulse supporter Prince Albert of Monaco was present at the Monaco control centre during Monday's takeoff. The U.A.E.-based Masdar, the Abu Dhabi government's clean-energy company, is a key sponsor of the flight. Additional sponsors include Omega, Google and Moet Hennessey, among others. As the plane waited on the runway, a brief electrical alarm threatened to delay takeoff, but it was quickly resolved, allowing the large plane to slowly lift off into the rising sun. "Everybody was just hoping the airplane will go," Piccard said. "Now the adventure has started."